Largely landlocked and mostly desert, Jordan also contains portions of the fertile Jordan River and the coral-rich Gulf of Aqaba, and has been home to numerous ancient civilizations. Now a constitutional monarchy, it’s one of the most liberal countries in the region, but still very Arabic in flavor. For many travelers, Jordan is synonymous with Petra, the famous lost city. 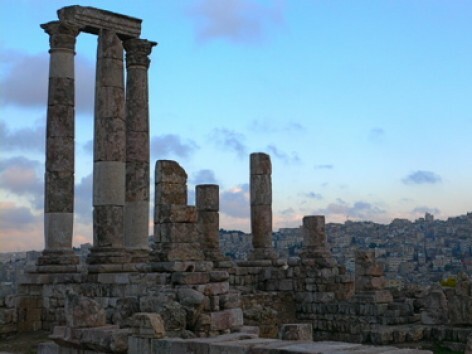 While no visitor should miss this awe-inspiring place, Jordan offers plenty of other cultural and geological treasures. During our five days here, we visited wind-carved wadis, Greco-Roman ruins, historic biblical sites and ancient Christian churches, and still didn’t see it all. We spent most of our time exploring the capital city of Amman and the deserts of central and south Jordan – we were completely fascinated by Petra, but our day in Wadi Rum, complete with petroglyphs, camel rides and lunch at a Bedouin camp, might have been the kids’ favorite.